The Queen has arrived at Kensington Palace to visit the new royal heir to the throne this morning. Her Majesty was spotted arriving at the Duke and Duchess of Cambridge’s new family home at around 11.30am, where it’s thought she’ll be told the royal baby’s name before she goes on holiday this Friday. The Queen famously told well-wishers that she hoped the Prince of Cambridge would arrive soon so she could head off on her annual trip to Balmoral this week, and she got her wish, when the little one arrived safely at 4.24pm on Monday evening, weighing a healthy 8lbs and 6oz. It will be the first time that Her Majesty meets the future King, but she’s likely to have watched the global coverage of the royal baby boy’s public debut outside the iconic doors of the Lindo Wing yesterday. 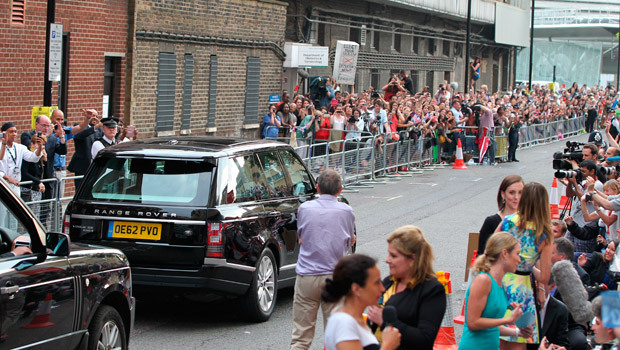 She told guests at an event yesterday that she was ‘thrilled’ about the royal heir’s arrival. The little one (and his royal wave!) is the star of every front page and website homepage this morning, cementing his social status as the most famous baby in the world. Prince William told reporters outside St Mary’s Hospital yesterday that he and Kate are ‘still working on a name, but hope to decide soon’. Royal sources say that the royal couple will reveal the heir’s full name to the Queen on her visit today, The bookies’ favourites are currently James or George. Exciting! Her Majesty arrived to meet her great grandson in a dark green Bentley from Buckingham Palace where the easel announcing the baby Prince’s birth remains. 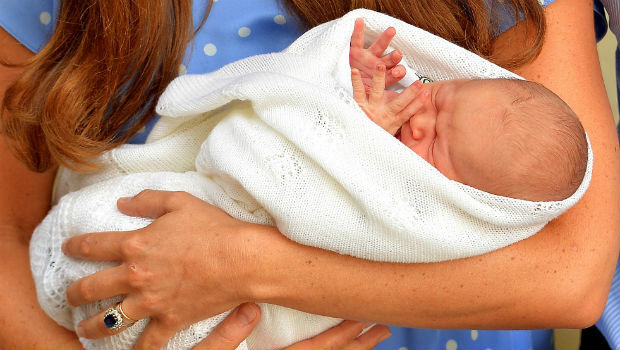 Last night he was visited by his new auntie, Pippa Middleton and her boyfriend Nico Jackson.